Imagine patients filling out their medical history or answering a health questionnaire, and once they are finished you don’t have to scan in their forms – or enter the information manually into the computer. The WRS Health Digital Pen writes like a normal ink-based pen, but there is a huge difference. Once the digital pen touches the form, a small camera inside the pen captures all strokes made on the paper. The WRS Digital Pen can play a key role in help with the capture of key measures. Please ask your practice management consultant for details. When patients use this unique input tool to complete health surveys or other forms, the data is immediately transmitted into the patient’s chart. Patients love the convenience of using pen and paper. Your practice benefits because no scanning or manual data entry of patient form data is needed. 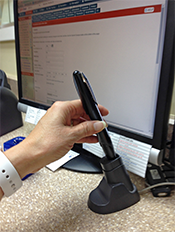 The digital pen is a perfect solution for physicians that rely on forms or free text for most of their charting needs. Many practices embrace the Digital Pen for initial patient intake documents (for those patients who were unable to complete them online in advance) and to capture patient signatures on consent forms and other material.